Nigerian soccer legend Nwankwo Kanu has been inspired by Liberian icon George Weah’s feat, by announcing his intention to run for President of Nigeria in 2019 general elections. 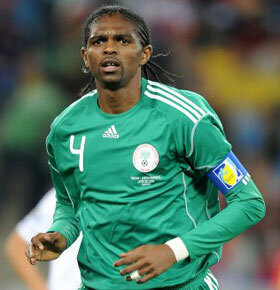 “My presence here today is about the future of our country and the happiness of our people,” Kanu told Goal.com. “The last 18 years of leadership has witnessed a decline in all critical sectors of life in Nigeria, plus general insecurity in the land. “Also, I’ll do all it takes to wrestle corruption which has become blatant and widespread. The rest of the world looks at Nigeria as the home of corruption,” Kanu, who also had a successful career in Europe, added. “If I get your mandate, I promise to do things differently and restore honour and integrity to public service by keeping the best and attracting the best. “George Weah’s victory in Liberia is a pointer that this dream is very realistic with you all on my side.” Kanu, 41, will be hoping to unseat incumbent president Muhammadu Buhari during the Nigerian general elections which will be held in Nigeria on 16 February 2019.